Captain Billy Baum has been fishing the bountiful waters off Oregon Inlet, North Carolina for over 50 years. A native of nearby Wanchese, Baum spends summers in his home waters and his winters in Florida, where he has been escorting charter fishing parties for 33 years. 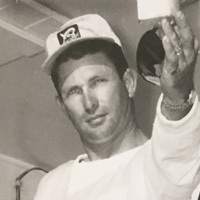 Baum became widely known and admired among coastal anglers during his long career-- not only for finding and catching fish, but also for building high-quality boats. Each of his six custom-made boats was named Dream Girl. Baum retired in 2004, but he still owns the 57- foot Dream Girl skippered by Captain Jason Snead out of Oregon Inlet. Baum estimates that he has fished approximately 60,000 charter clients in his career. Among his most memorable trips was an exceptional day of big-eye tuna fishing where his charter customers boated eight ranging from 175 to 200 pounds. Baum’s clients also caught and released numerous big blue marlin off Oregon Inlet, with the largest estimated at 600 pounds.